Next time you sing Itsy Bitsy Spider to your baby or toddler, add some pint-size asanas for a custom kiddie yoga class. Itsy Bitsy Yoga claims to soothe frazzled infants, stretch tiny limbs, capture toddler attention, and remind exhausted parents that the little person who's taken over their lives is actually fun. Itsy Bitsy Yoga was created by Helen Garabedian to encourage bonding and infant-toddler development in a class for the youngest yogis. Garabedian's book, Itsy Bitsy Yoga: Poses to Help Your Baby Sleep Longer, Digest Better and Grow Stronger, (followed by a companion toddler book) gives some developmental insights and illustrates simple moves you and your baby or toddler can do together. The program is offered by certified teachers in yoga studios, community and church centers, and other places that serve young families and provide infant enrichment. Aside from the all-important relaxed bonding time, an Itsy Bitsy Yoga session includes gentle massage, rhythmic movements and stretching, and cheerful nursery ditties to keep the sequences flowing. It's a low-key session with constant physical contact and lots of smiling. It has many benefits for your baby. Baby's internal organs are stimulated, helping to relieve gas. Tiny muscles are stretched, opening the chest and lungs for better breathing. Opening and closing arms and countering the natural contraction of a curled up infant relieves stiffness or tension. Simple bouncing exercises provide an opportunity to strengthen legs and small bare feet. Baby yoga is a whole-body experience that can result in a happier little person who sleeps and smiles more easily. Baby class welcomes the tiniest yogis from birth to about 9 months, when infants start to crawl. Then they graduate to Tots class, which is for babies and toddlers 10 to 24 months. These mobile little guys are working on poses you know. Down Dog is very big with the Tot set. Tykes class practitioners range from about two years old to age four. You have to make an effort with those flexible talented tykes, or they'll show you up every time. There are more than 100 poses in Itsy Bitsy Yoga, but no worries if your skills are a bit rusty. In the weekly 45- to 60-minute session, parents and caregivers are guided through a few moves, and the instructor demonstrates the baby or kid positions right along with you. No previous experience for you or your offspring is required. Babies and their caregivers sing -- or gurgle -- nursery rhymes and move through simple yoga postures, such as Toes to Nose, designed to help infants settle down and sleep more soundly. Toddler poses look more like a real miniature yoga class with simple Hatha Yoga sequences that mimic mom's. Yogi-Yogi pose is a series of moves with the baby face up on a yoga mat in front of the caregiver who manipulates limbs and lightly massages the torso and tummy. Knees are flexed and legs extended in knee-to-chest. Then each leg is rotated in the hip socket and both legs are circled around in a corkscrew that releases the lower back, followed by clapping the soles of small bare feet together. The infants are engaged, watchful, calm and alert -- the movements aid digestion, flexibility, and happy-baby time. Hop-Along Yogi soothes fussy and finicky infants. Moms or dads sit on the mat, legs extended, with the baby seated on one thigh, snugged securely against the parent's torso. To a sing-song Hop-Along rhyme, the grown-ups bounce their legs up and down, keeping heels in contact with the mat and holding the baby securely under the arms as baby bounces along to the song. Start with about fifteen slow bounces, then a double set of fast bounces, ending by extending your arms to whoosh baby up in the air and down. It puts even the crabbiest tiny person in a chill mood. 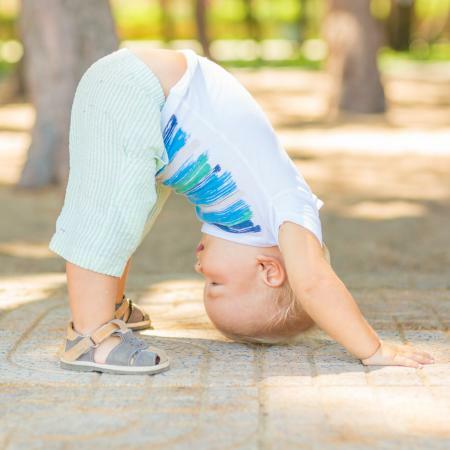 Toddlers can begin to perform mini asanas. Toddlers start working with classic yoga poses such as downward facing dog. That's a natural asana for a little one experimenting with balance -- hands and feet on the floor, diaper end up in the air -- and it's no problem at all with supremely flexible hamstrings. Toddler tree pose is wobbly fun with hands on hips, weight on one leg, and the instep of the other foot resting against the calf of the standing leg. If that raised foot doesn't make it higher than the ankle, there's always the next class to tackle the challenge. Cobra pose is old-news for this age group. They've been lying on their stomachs, legs extended, palms flat, and pushing their chest, shoulders and head up and back into an arch since they were, well, babies. An almost-two can easily memorize a sequence of mountain pose, flowing into tree, down dog, child pose, cobra and upward facing bow. Enhanced motor and neuromuscular development. If you never made it past the enticing promise of longer naps on that list, you're not alone. Better sleep is a big draw for both you and that fussy wide-eyed baby. Dress for success for your Itsy Bitsy session -- that means comfortable threads you and the young yogi can move in freely. Most studios provide mats, but feel free to bring your own towel to place on the mat and under Buddha baby. This is all about ease and comfort for both of you, so bring a lightly packed diaper bag to cover emergencies. Try to take care of necessities before class when possible so you can focus on the yoga and not on lunch. In a pinch, feeding the Princess of Poses is perfectly fine. Check ahead with your studio to clarify any policies they have for activities during class. Most Itsy Bitsy classes are offered in multiples -- typically a six or eight week series. Small people like stable surroundings and will learn to recognize class time as yoga "play" time, so drop-ins can be disruptive and are usually discouraged. It's a good idea to plan for the baby-level class when you know your approximate due date. Pint-size yoga is popular, and some classes may fill up early. You may want to reserve a spot or risk waiting weeks or months for the next opening. Go slow with that precious bundle of joints and muscles. Sing along with the songs to pace yourself and stay centered on the star of the show. The younger your yogi, the more gentle and controlled the movements should be. Don't hyper-extend arms or legs, even though babies are as bendy as noodles. Offer head support at all times for the under-6-months set because they can't control that heavy satellite on the top of their neck. 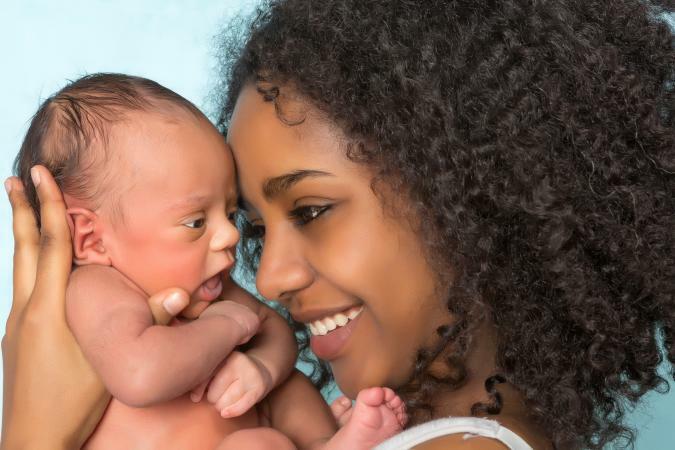 Babies' soft spots also need attention to avoid an accidental head bang. Expect about 20 minutes of exercise for the littlest ones, with frequent breaks for explanations and sharing. Those breaks are important for preventing exhaustion and injury. You love your warrior pose, and your mini-me will learn to love it as well. Sharing early childhood yoga class strengthens a family habit of respecting and exercising the body. The intense interlude of playful physical contact and direct eye contact with your child gives you a fun, together-time yoga practice, and the potential hours of unbroken sleep to enjoy it.